Fishing interest: Surf Fishing,Offshore Fishing,Net Casting. I got fish,i bring home. You got fish,pls practice catch and release(LOL). That's a very nice fish and it's good to see Punggol Park can still produce these sized KBL. It pays to keep your eye on the water, you'll know when to be more on your guard when the fish comes. 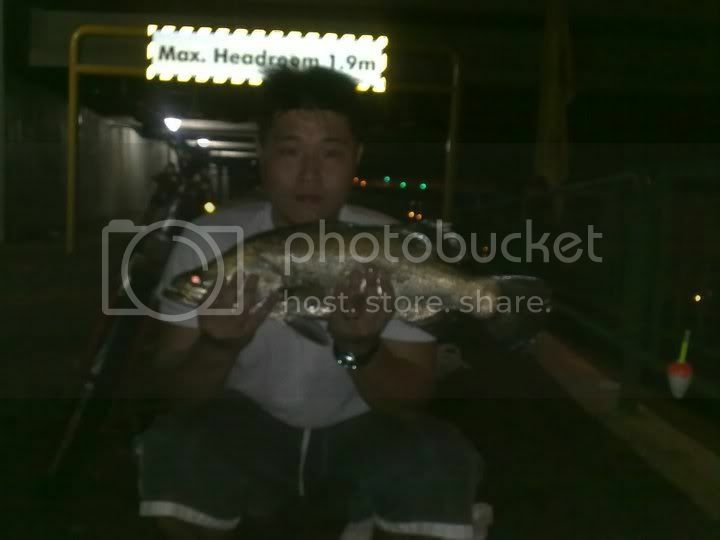 Welcome to HLF thomasfong83 and thanks for sharing your wonderful catch with us. That area is prohibited fishing grounds as per NEA,however, I too seen lots of regular chinese national and retiree fishing there.As i am staying nearby there,my advise is that better check before taking the risk.Anyway nice catch. i think better not to take the risk,same to you guys.. Isn't punggol park and lim chu kang very far frm one another? Nice catch there. If I am not wrong, the longkang there is now leading to a reservoir (Serangoon Reservoir) and not out to the sea anymore. So suprising to see that KBL still surviving there, I was trying to hunt for a peacock bass there instead haha..
Wow nice catch. Ya the connector like no longer connected to the sea, used to hear from uncles who fished there say got alot 8-12kg kims. Guess some of them still surviving because they can adapt to fresh water. And you might want to hide your face from the pic, I also not sure whether NEA can catch you like this anot, just to play safe . I live near the canal and Punggol park.. So far I also heard Punggol park also bring some kbl inside but outside this is the first time I saw people catch this...one question what bait u use or what lure u are using? weaver wrote: I live near the canal and Punggol park.. So far I also heard Punggol park also bring some kbl inside but outside this is the first time I saw people catch this...one question what bait u use or what lure u are using? I think he mentioned using dead prawns. But be careful because the place had turned into a reservoir since they build the dam (DAMN!! ), and so I supposed fishing with bait is illegal, not too sure about luring.